Simplus | How to get to Platinum fast, the Simplus way! 09 Dec #consultingpartnerhacks: How to get to Platinum fast, the Simplus way! The Salesforce global Consulting Partner Program is an incredibly useful way for companies to demonstrate their knowledge of and capabilities in navigating the Salesforce landscape. And just last quarter, Simplus joined the exclusive ranks of Platinum partner status—from Silver to Platinum in just 18 months! For some, the task of achieving Platinum status can feel like a daunting endeavor. But not if you do it the Simplus way! In this blog, EVP of Business Development Lance Evanson and Senior Manager of Business Intelligence James Davis help you understand the tips, tricks, and hacks that Simplus went through in order to get to Platinum status fast. What is the Partner Value Score and how is it measured? Before moving forward, it’s important you know how partner levels are obtained. 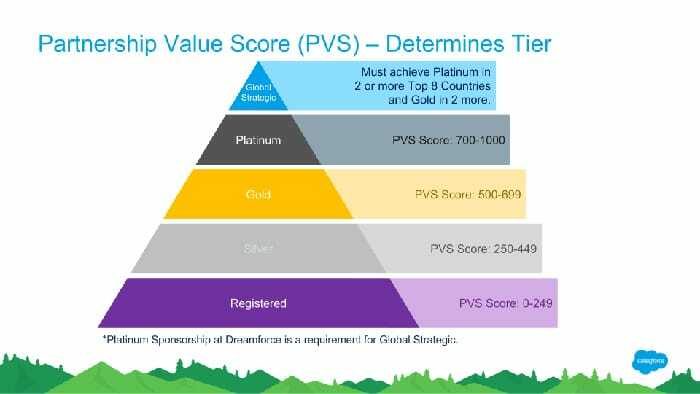 Your level is determined by a company’s Partner Value Score, or PVS. 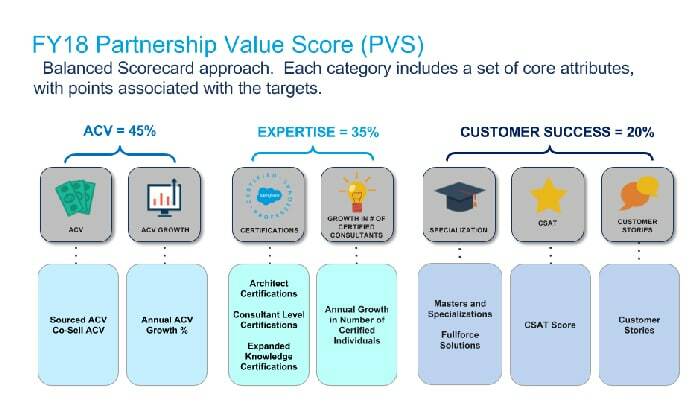 The PVS is a fairly simple breakdown of the core competencies of a Salesforce partner. There are three branches that make up your score: Annual Contract Value, Expertise, and Customer Success. ACV: This is the most heavily-weighted category at 45% of your total score. It measures the value of your various contracts and the overall growth of that value. Expertise: Another 35% of your score comes from how adept your team is in the various areas of the Salesforce ecosystem. This includes employee certifications and the growth of certified consultants. Customer Success: Customer Success encompasses specializations, CSat scores, and customer stories. This is weighted at 20% of your total PVS. It can feel like a bit of a challenge to reach Platinum looking at that big, scary score at the top of the pyramid. But once you actually understand what each one of the aforementioned categories mean, it can feel much easier. You just need to have the correct path laid out, dedicate the time and energy to be able to understand that path, and allocate the necessary resources in order to succeed. So, let’s address the question that is perhaps looming most in your mind: Why should you even care about becoming a Platinum-level Salesforce partner? Will it really change the behavior of Salesforce or your own company and help you grow? The simple answer is absolutely! Now, can you grow without participating in the Salesforce partner program? Sure you can—but it’s more likely that you will see greater success at a quicker rate if you set a goal to become a high-performing partner. This program is tailored to help you align your organization with other Salesforce partners and the Salesforce sales team. Not to mention that being able to tell your potential clients that you are a Platinum partner is a great selling point; it tells them that you are a Salesforce expert, have a positive customer satisfaction, and are equipped with the resources to help them reach their goal. As mentioned above, Simplus saw a meteoric rise in its PVS in a extremely short amount of time—from a Silver to a Platinum partner in just 18 months. So, how was this feat accomplished? There are three main points that we recognized in our journey to becoming Salesforce Platinum partners. The success of any company initiative starts at the top. It is integral for the organization’s leaders to champion a objective—nothing says “success” like having the executive leadership rally the troops. Having the entire team on board with the plan is the only way you can hope to see company aspirations come to fruition. The next step is to bring the entire team into the picture and formulate feasible goals. This is where you figure out what your PVS goal is going to be every month. It’s important to be realistic yet optimistic with your monthly goal-setting. Once you have total alignment on your goal, you need to be persistent in your stewardship to that goal. This means holding each other accountable to the scenario you’ve set in place and checking up on an incremental basis. Don’t let the goal slip away from your team’s sight! In between those intermittent PVS checkups, you will want to have someone who is driving the plan to make sure the goals are being met. The good news is that this process actually doesn’t require a whole lot of time. It just calls for the focus and determination of a team member to analyze and report data points. Once you have a system in place that is simplified and standardized, you’ll want to begin looking at how you can automate as much of the process as possible. If you are using Salesforce (chances are if you are reading this you probably are! ), you should be utilizing its powerful automation features to drive more of the process naturally. With a few custom fields and automation, you can set up tools to have sales reps easily update the data for you, as well as schedule reports to feed you this information. While your ACV is perhaps the most process-heavy parameter of your overall PVS, the scores of your expertise and customer success are just as important, and they are often fairly easy to obtain! Here are a few things you should be doing to bolster your score as much as possible. Customer success stories: These are easy grab points for anyone! These are a part of your CSat score, and you can submit up to 10 of these for five points apiece. Salesforce even provides a template for you to present your success stories on. Specializations: Again, these are easy to accumulate. Simply make sure you have all the proper products selected before you close the Project in the Partner Community. Certification rolloff insurance: No one wants to lose points because someone forgot to take a maintenance exam. If you fall more than two exams behind, your points for a certification could roll off. Internally, Simplus has set up a simple process to track all employee certification exams. Gamify your certifications: Take the certification process to the next level and turn it into a competition. We created an internal club system that incentivizes certifications with company acknowledgement and various prizes the further you go. Employee dashboard: Give your employees a medium to track their progress and steps to their next certification. The journey to the upper echelons of the Salesforce partner pyramid can seem like a long and arduous process. However, as Simplus proved, it doesn’t have to be! All it takes is the right leadership, dedicated resources, and an effort to streamline your PVS records as efficiently as possible. And don’t forget to pick up those easy points mentioned above either!